After a couple quarters of relatively quiet activity in the markets, the fourth quarter jolted investors awake. Stocks fell sharply, credit spreads widened, and volatility surged, as major equity indexes neared or entered bear market territory (defined as declines exceeding 20%) to end the year. As is usually the case with complex, interconnected global financial markets, it’s hard to pinpoint exactly which factors caused markets to decline and to what degree. However, the general consensus seems to be that the selling was mostly explained by the concerns of slowing economic growth, continued trade conflict with China, and fear that the “Fed Put” will prove less reliable under Jay Powell than previous Fed Chairs. After outperforming larger stocks in the first nine months of the year, small cap stocks tumbled in Q4 and ended the year lower than their larger counterparts. The Russell 2000 returned -20.20% in Q4, while the Morningstar Small Cap and S&P Small Cap 600 indexes returned -19.54% and -20.11%, respectively. The 20% decline for the Russell in Q4 was the worst since Q4 2008. Although the quarter would qualify as a bear market by the threshold most market pundits adhere to, it’s important to separate price from fundamentals. While the market volatility and sharp decline is reminiscent of 2008/2009, business earnings are still generally strong, and we are not in a recession. 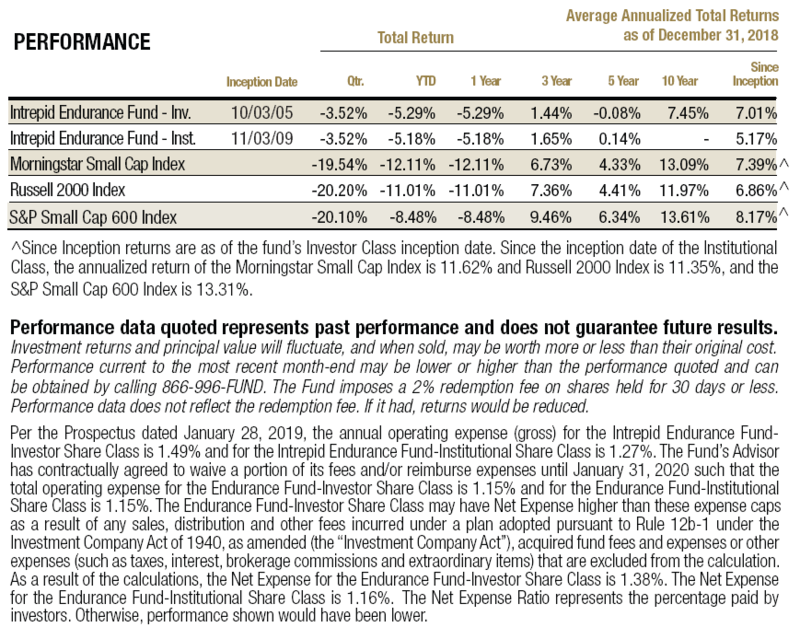 The Endurance Fund (“the Fund”) significantly outperformed its benchmarks in the quarter thanks to its large position in short-term Treasuries. For the quarter ended December 31, 2018, the Fund returned -3.52%. 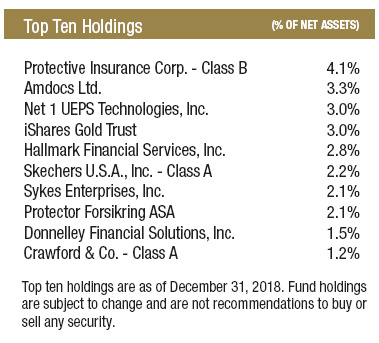 The only material positive contributor to performance was the position in the iShares Gold Trust (IAU). Gold rallied 7.7% during the quarter as investors flocked toward “safe haven” assets. The Fund’s top three detractors for the quarter were Net 1 UEPS Technologies (ticker: UEPS), Protective Insurance Corporation (ticker: PTVCB), and Amdocs (ticker: DOX). In November, UEPS reported first quarter earnings that drove the stock down precipitously. As expected, the contract with the South African Social Security Agency (SASSA) was successfully terminated at the end of September, but the losses from the legacy cost structure of the SASSA contract ate into profitability more than expected and spooked investors. These losses were exacerbated by an ongoing legal dispute with the government over how much UEPS should be paid for the final contract extension. UEPS also reported that the EasyPay Everywhere (ticker: EPE) service offering was losing members at an alarming rate, primarily because SASSA had illegally force migrated grant recipients off the platform. All of this led UEPS to revise its guidance down. Despite the first quarter hiccup that drove the stock down, we are still bullish on UEPS. We knew that the transition away from the SASSA contract would be messy, but a few recent announcements have given us hope that the company has turned a corner. First, the government ruled that the grant recipients who had been force migrated off the EPE platform by SASSA should be reinstated. This means EPE will have most of the lost members brought back in January. Additionally, the Constitutional Court in South Africa ruled that SASSA and UEPS should engage directly to finalize remuneration related to the contract extension. The reimbursements should help offset operating losses incurred by the UEPS subsidiary that handled grant payments in the first quarter. Lastly, the company’s South Korean payment processing business, KSNET, as well as several of UEPS’ balance sheet investments continue to perform well. Combined with a core South African business that is now unencumbered by the SASSA drama, we believe UEPS has troughed, will continue to generate free cash flow, and is primed for growth. Protective Insurance recorded a large adjustment to its commercial auto reserve in the quarter, indicating their challenges in this business line are not over. The company is not alone in its struggles with this sector and has been aggressively raising rates in response. In addition, the company’s CEO abruptly resigned in October which continued a disappointing trend of executive and board member departures. The selloff, most of which took place after these events, was likely also influenced by general market selling, as well as Protective’s exposure to the equity markets via its investment book. At year-end, the stock was trading at a mere 64% of tangible book value, which matches its trough valuation in the depths of the financial crisis. In perhaps a sign of good news, the company announced in October that it formed a sub-committee to explore opportunities to maximize long-term value, including the possibility of a transaction. We think the company would fetch a valuation far higher than today’s price in an acquisition but believe the stock represents a compelling opportunity regardless of whether the board decides to sell. The decline in Amdocs stock was likely due to general market selling. In fact, the -10.85% return for the stock in the quarter was roughly half the Russell 2000’s decline. Amdocs continues to chug along and managed to grow sales in Q4 by 2.3% despite a major headwind from its largest customer, AT&T, making the decision to reduce discretionary spending following its acquisition of Time Warner Inc.
We took advantage of the significant market volatility to purchase four new positions during the quarter: Skechers USA, Inc. (ticker: SKX), Sykes Enterprises, Inc. (ticker: SYKE), Protector Forsikring (ticker: PROTCT NO), and Cabot Oil & Gas Corporation (ticker: COG). Promoted by celebrity brand ambassadors such as Tony Romo and Camilla Cabello, Skechers USA, Inc. (SKX) is the leading US footwear company in the walk, work, casual dress, and casual lifestyle segments. While growth has matured domestically, SKX is expanding quickly overseas and now sources over half of its revenue outside of the US. Despite growth that has seen sales double since 2014, investors have become frustrated that investments to expand distribution overseas have limited bottom-line growth over this period. They have also become increasingly wary of Skechers’ exposure to weakening economic trends in China, which is a major growth engine of the company. We believe a slowing growth profile has been more than priced into the stock – which is down 50% since March – and believe the company could show significantly higher earnings power were it to pull back on its marketing and distribution investments. The stock currently trades at a healthy discount to reasonable valuation assumptions and sports a very strong balance sheet with no debt. Sykes Enterprises, Inc. (SYKE) is a market-leading outsourced call center operator. SYKE is juggling several issues at the moment, including challenging wage and labor availability trends, a reduction in call volumes at major telecom customers, and low capacity utilization at its domestic call centers. However, these are relatively common occurrences in the call center industry, and SYKE is taking active steps to address them by moving customer programs overseas and rationalizing a large percentage of its US capacity. Margins have already begun to recover to normalized ranges. Like Skechers, SYKE’s balance sheet has no debt net of cash. Protector Forsikring is a Norwegian property & casualty (“P&C”) insurer. They write business in a variety of sectors and mostly sell to small and medium-sized corporations and municipalities. The company operates with an extremely low expense ratio, allowing it to undercut competitors on price. This price advantage has helped Protector grow rapidly since it was founded in 2004. Over most of this time, the company delivered excellent underwriting results. However, a recent string of poor results led to a more than 50% selloff in the stock in 2018 and allowed us to establish a position at what we believe is an attractive valuation. The Scandinavian P&C insurance industry is uniquely concentrated among a few firms, which have historically earned excellent returns on equity. If Protector can achieve results similar to the industry average or their historical average – something we think is very realistic – there is likely significant upside in the stock. In December, management announced the company is exiting the business line that has been the main problem area for the company recently, so there is reason to believe the worst is behind them. Cabot Oil & Gas Corporation (COG) produces over 2% of all the natural gas in the United States out of its Marcellus property in Pennsylvania. We believe it is one of the most high-quality energy companies in the small cap universe, but that because of its focus on natural gas, this has been unrecognized to date by investors. Due to its attractive reserve base, COG is a low-cost producer that expects to grow production over 20% in 2019 while reducing capital expenditures and generating ample free cash flow – a combination of qualities that is highly unusual in small cap energy. Like our other purchases this quarter, the company has also kept an extremely strong balance sheet that introduces almost no credit or liquidity risk to the company. While the new additions to the Fund are very diversified in terms of industry and end market, they all are the type of high-quality, growing businesses that we expect to focus our efforts on going forward. In addition, each purchase in Q4 possesses a very strong balance sheet. While we are not opposed to taking financial risk when priced adequately, companies with higher debt burdens performed very poorly in Q4 as interest rates rose and credit quality concerns emerged. As a result, we are now actively searching for small cap opportunities with stable operating profiles and higher (but still manageable) debt loads, but whose stock prices have fallen significantly and could indicate financial risk has become over-discounted. For the calendar year ended December 31, 2018, the Fund returned -5.29% compared to returns of -12.11% and -8.48% for the Morningstar Small Cap and S&P 600 Small Cap Index, respectively. The Fund’s performance for the full year was hurt by a few securities in Q1, while almost all of the outperformance came in Q4. The top three contributors for the year were Primero Mining convertible bonds (CUSIP 74164WAB2), Syntel (ticker: SYNT), and Crawford & Company (ticker: CRD/A). The top three detractors were Net1 UEPS Technologies (ticker: UEPS), Retail Food Group (ticker: RFG AU) and Protective Insurance (ticker: PTVCB). As we enter 2019, we are very optimistic about the investing environment for the Endurance Fund. After the major selloff to close out 2018, many of the businesses we follow are finally beginning to trade at prices that represent better buying opportunities. The level of cash in the Fund decreased from 82.5% as of September 30, 2018 to 73.2% at year-end. We anticipate gradually reducing this level further over time, especially if volatility continues. At the same time, we are mindful of the length of the current economic expansion and the multitude of risks facing companies. As always, our primary focus remains on capital preservation. The Morningstar Small Cap Index tracks the performance of U.S. small-cap stocks that fall between 90th and 97th percentile in market capitalization of the investable universe. The Russell 2000 Index consists of the smallest 2,000 companies in a group of 3,000 U.S. companies in the Russell 3000 Index, as ranked by market capitalization. The S&P SmallCap 600 measures the small-cap segment of the U.S. equity market. The S&P 500 Index is a broad based, unmanaged index of 500 stocks, which is widely recognized as representative of the U.S. equity market in general.You cannot invest directly in an index. Tangible Book Value is the total net asset value of a company (book value) minus intangible assets and goodwill. Free Cash Flow measures the cash generating capability of a company by subtracting capital expenditures from cash flow from operations.